I still have one recipe still pending from my travels through the US. We visited my mum's uncle, Joe and his wife Ila in Michigan. They live in Farmington Hills not far from Detroit and have a fantastic house opposite golf greens and luscious green woods. A huge deck overlooks this gorgeous view. During our stay there we had temperatures in the 30's°C (90'sF) and beautiful sunny skies. Just the perfect setting for a great family barbecue. I had not seen uncle Joe in something like 20 years! It was just great getting together and chilling in his cool basement which he has completely renovated as a family entertainment floor, complete with fitness area, small kitchen, movie and music area and sauna! It was too hot to use the sauna but I was able to take in a hindi film. One of the dumbest I have seen in a very long time - "Pyare Mohan"! I won't even go into it coz it's just not worth it. Early morning I watched uncle Joe and Ila aunty prepare the barbecue chicken for that evening and I just knew I had to get my camera out and take pictures of this recipe and share it with you all. I was also enamored with this kitchen tool uncle Joe picked up in India. 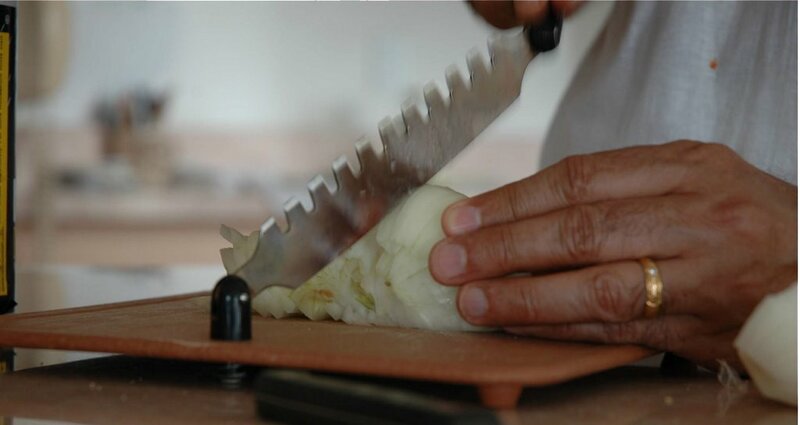 An onion and herb chopper that made the tedious work of chopping in large amounts look so easy. I thought the pictures of it action came out really well, what do you think? You know what, this was such a great moment that I really thought if I should change my profession to taking pictures full time. It was only for a moment though because my pictures are not THAT great to make a living off. Anyway, I just enjoyed watching someone else cook and I hand my hands free to take all the pictures I wanted to. 1. Think about the recipe for a long time. Decide on the artistic photo I would like to take of the ingredient/food. 2. Depending on the food/ingredient, set up my picture taking zone accordingly with the appropriate colored backdrops and so on. 3. Start preparing the dish in the kitchen. If I need to take intermediate photos (photos that are taken at different stages of the preparing/cooking process) then I need to rush to my photo zone, take a few pictures, check on the notebook if they turned out well. At the same time trying to keep an eye on the cooking of the dish. 4. When the dish is ready, arrange it so that it looks good, take it back to the photo zone, take the photos, check on notebook. This all while making sure the dish itself remains hot or at least warm! How many can relate to this? I really enjoy doing this but this time it was just great to be able to concentrate on one. It would be a difficult choice, anyway, if I was forced to decide between one of the two. There are times when I love the photography other times I can relax and enjoy the cooking. Often, I love the hectic of both! 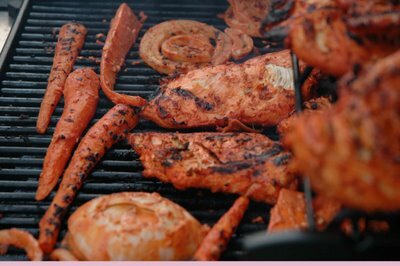 So, as the season is just perfect for barbecues I leave you with this great recipe of barbecued hot, spicy , gingery and garlicy tandoori chicken and open the theme to my next month's event - King/Queen of Barbecue! natural yoghurt - don't go for the low fat version as this is often too runny. Use a nice thick yoghurt. Clean the chicken breasts and slash them lightly with a sharp knife. Rub well with salt and pepper. In a large mixing bowl pour the yoghurt and add the tandoori paste and mix well. The yoghurt takes on a lovely pink/reddish color. In another mixing bowl mix the chilies, garlic, ginger and rub a bit of this on and into the chicken. Add the rest to the yoghurt mixture, together with the onions. Salt and pepper to taste. Now place the chicken breasts into this mixture and allow to marinate for 6 - 8 hours or overnight. Heat up your barbecue and grill each breast until nicely done. My uncle added some carrot sticks and onion rings into the leftover marinade and grilled these too. I leave this to you if you choose to do this. Serve with lime wedges, mint chutney and fresh salad. WOW! I love chicken off a grill but normally if it is not taken off just at the right moment it becomes very dry. This here was juicy, and the flavors of the ginger and garlic blended beautifully. The chilies added the right spicy note and the tandoori spices made it truly exotic. I really liked the idea with the mint chutney as it was the right type of sauce that held it's taste with the chicken and added a divine minty and fresh touch. There was not much left over of the barbecue and we all sat back, satisfied and silent, only like when one is when they are so pleased with themselves. That gadget looks brilliant, I would love one of those!! Totally relate to what you were saying about the stages of cooking and taking photographs for your site, as Stewart will testify I go through an almost identical process, LOL! Tandoori chicken has been a favourite dishe of mine since I was a child, I think it was the first ever Indian dish I ever tasted, it was then I became hooked on the flavours of Indian cookery. Sounds like your family had a great afternoon! I too love tandoori flavors, on meats and vegies as the spices are truely gorgeous! I like the sound of these spices and the carrot looks so good to me. Wild looking gadget your uncle is welding.